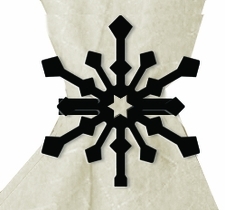 The napkin rings are created of wrought iron with a snowflake silhouette. They have a baked on black satin matte powder coat finish. This American made wrought iron napkin ring is handcrafted in Fabius, New York, by Village Wrought Iron.